'Spain Squad' briefly brought @Hitler back to life. When Twitter takes an offensive account offlinen it usually stays down for good, but a hacking group now claims that it's discovered a way to reactivate and take control over inactive and suspended accounts. 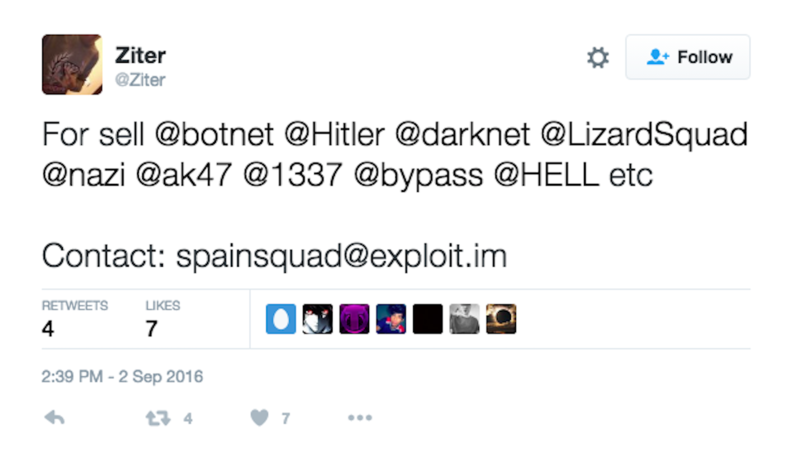 A group called "Spain Squad" briefly reactivated banned accounts like @Hitler, @DarkNet, @1337, @Hell and @LizardSquad -- hoping to sell them to users seeking valuable screenames. Akma, one of the users behind the exploit, told Business Insider that the group can do a lot more than just recover old accounts. Apparently the new exploit allows Spain Squad to change to suspend active accounts, change a user's Twitter handle and even take control of active accounts. So far, the group has only demonstrated the ability to recover officially suspended accounts -- though all of those have already been re-suspended by the social media company. The details of how the group managed this aren't clear, but if the hacker group can still perform the trick, it could be extremely lucrative for them. Unique or short Twitter names have been known to sell for thousands of dollars, and hackers have gone to absurd ends to illegally obtain these usernames in the past. It's not clear yet if the exploit has been patched, or if the reclaimed accounts were merely re-suspended. Either way, we've reached out to Twitter for more details.